"We have more than a million people from Ukraine, who are generally labor migrants." In Poland, the procedures for granting political asylum are fairly strict and few people have been granted refugee status in Poland. However, there are more than 1 million Ukrainian migrant workers in Poland, of whom tens of thousands fled from areas affected by the war, Polish Prime Minister Mateusz Morawiecki said as quoted by PAP. "I presented our position in a little different light. Indeed, our asylum procedures are quite tough, since figuratively speaking, you can count persons who have received this status on the fingers of one hand. 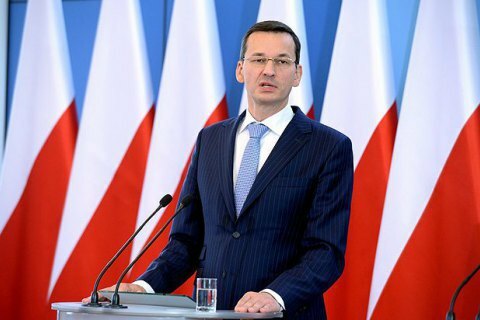 However, we have shown thousands of asylum applications filed in Poland," Morawiecki said after a meeting with European Commission President Jean-Claude Juncker in Brussels. Presenting his own arguments regarding the reluctance to receive refugees from the Middle East and North Africa, the Polish president said that Poland had admitted Chechen refugees who had fled their homes after two Russian wars, and that "at least tens of thousands" of more than 1 million had escaped war-affected areas. "I also spoke about the problem of the Russian-Ukrainian war, which led to the fact that we have more than a million people from Ukraine, who are generally labour migrants. However, if you take a closer look at the statistics, at least several tens of thousands or more are persons from areas afflicted by the war, without a roof over their heads, typical refugees from the territory of eastern Ukraine," the Polish prime minister said. He noted that Poland did not change its position on the issue of refugees and would not give shelter to migrants from the south. As the agency informed, in early December the European Commission brought an action against Poland, the Czech Republic and Hungary in the EU court due to the non-fulfilment by these countries of a 2015 resolution on participation in the procedure of mandatory distribution of refugees. Morawiecki and Juncker also discussed the future of the European Union, Poland's role in the bloc, internal market policy, energy policy and Brexit.